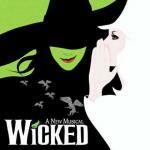 Finale by Kristin Chenoweth with length 1:41 – in fact, the final covering theme of all of the Broadway musical "Wicked", which is sung by a choir of actors. The main theme of given to beautifully clean female voice. Melody develops and elegantly finishes on a high note, leaving the listener with only positive emotions. Now at last she's dead and gone. Now at last there's joy throughout the land. Who can say if I've been changed for the better, but.